This is the most comprehensive guide to skiing in Argentina for 2019. Today you are going to learn how to make your ski trip a reality. From the best resorts to adventurous guided tours. The best time to ski Argentina, where to go, how to get there and much more! Argentina, known for tango, Malbec wine, Buenos Aires (the “Paris” of South America) and Patagonian gaucho culture, is also known as one of the world’s best ski destinations. Few countries on the planet can match Argentina’s formidable terrain and dry powder, and there are more than 10 ski resort destinations and extensive backcountry options to explore. 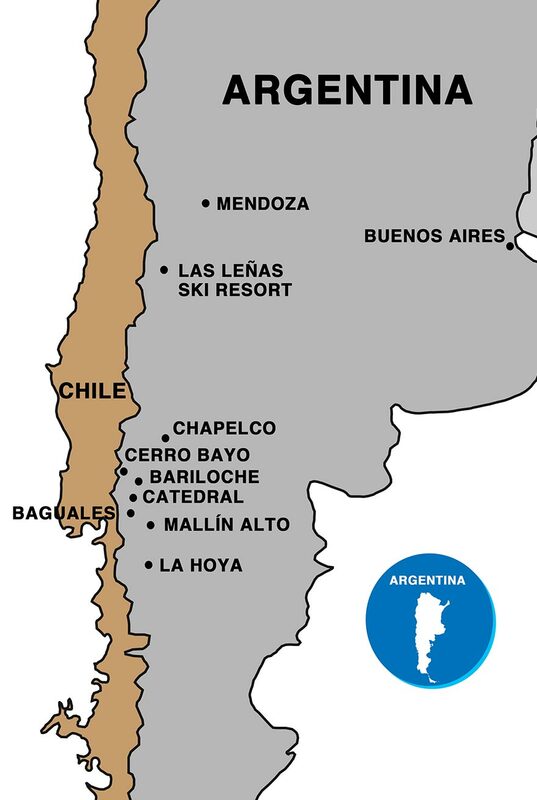 As Latin America’s second-largest country, Argentina’s landmass is mammoth, encompassing the coastal Atlantic Ocean, undulating swaths of “pampa” grassland, and the eastern half of the rugged Andes Mountains, which cut a mighty range of snow-covered peaks and volcanoes from the epic resort Las Leñas to Cerro Castor resort in Ushuaia, Patagonia, the southernmost ski resort in the world. Argentines are steeped in culture, both home-grown and from the heavy influence of immigrants from Italy, Spain and Germany. I have fallen in love with the Bariloche area of Argentina. For me there is something about ski touring through perfect granite spires while overlooking beautiful lakes that will never get old. Whether it is skiing at the ski resort or ski touring out of one of the Refugio’s, this area is hard to beat. When the summer temperatures explode in the Northern Hemisphere, Argentina’s ski resorts are cooling off and delivering stellar snow conditions in the Southern Hemisphere winter. Here you’ll discover the best time to go. You’ll also learn about what weather to expect while you’re traveling. 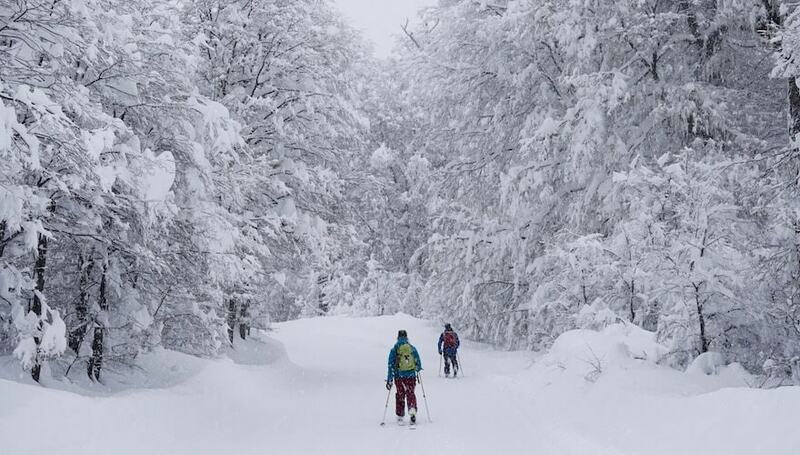 Like neighboring Chile, the ski season in Argentina runs from mid June until October. The best time for resort skiing and snowboarding is late July until early September. You can track how the season is developing by using apps like snow-forecast for 3-6 day snowfall predictions. Follow PowderQuest on Facebook for storm updates, photos, and reports. Some ski area websites (Cerro Catedral in Bariloche for example) have webcams and daily snow reports. Opening dates are updated here for the main South American ski destinations. As a general rule, June is still too early to roll the dice on a ski vacation. Yes, we have seen some outstanding Junes over the past 2 decades that we have called The Andes home, but it is recommended to hold off until the snow bases build. If June is the only time you can get away, one option is to wait to see how the early season develops. Do so by using some of the tools we listed above. If it is a good early start, you can generally find last minute availability at most hotels and ski areas. The prices this time of season are the lowest as well. July generally delivers great skiing conditions. Try to avoid the middle weeks of July when families book up all resorts and village hotels for the South American school holidays. Slopes get crowded and lift ticket prices shoot through the roof. The holiday skier traffic dissipates near the end of the month and snow depth is building. 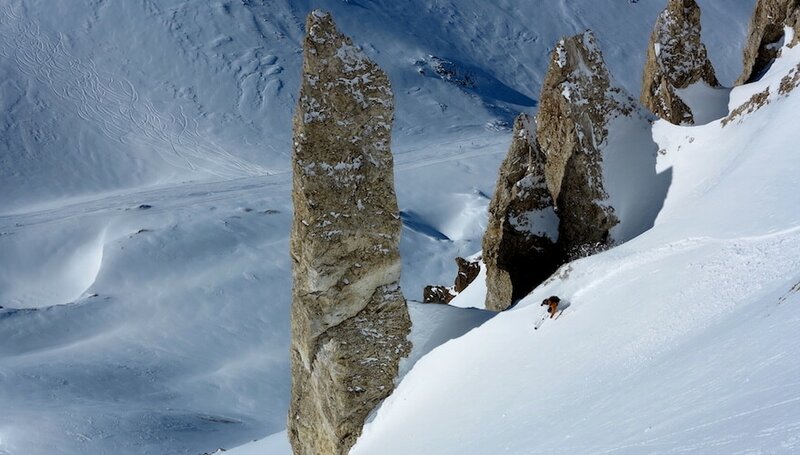 August is the most popular time for international powder hounds looking to ski the best snow conditions in Argentina. If snow quality is paramount, August ranks number 1, with September being a very close 2nd. Pro skiers and snowboarders flock to Argentina from August until mid-September for photo shoots, movie segments and to build up their social media content. 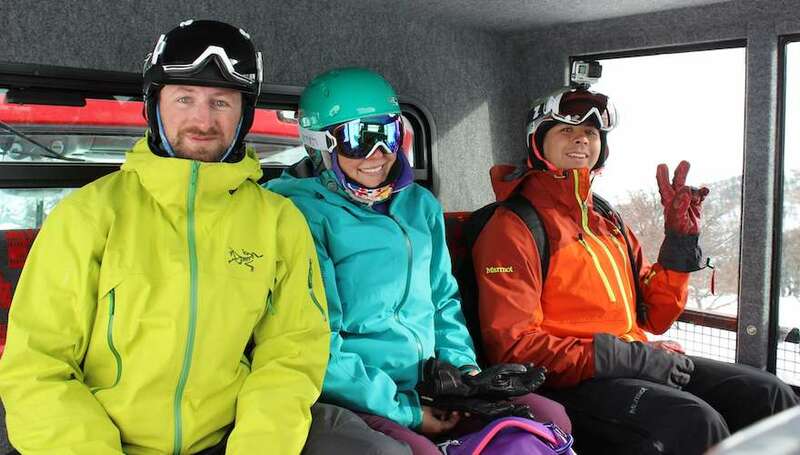 Don’t be shocked if you end up sharing a chairlift ride with one of your idols. We suggest a guided tour in August to mid-September, to take full advantage of the best conditions, visit multiple areas and ski zones you would most likely not find or ski on your own. Powder in Argentina should be on everyone’s “bucket list”. Mid-September to October is time to look deeper into Patagonia for the best ski conditions. While September can quickly open up into spring skiing conditions, we have seen a pattern over the past several ski seasons of cold temperatures and heavy snowfall well into October. This has especially applied to the Patagonian ski resorts Chapelco, Catedral, and La Hoya. Resorts tend to close for the ski season between early and mid-October, depending on snow conditions and local demand. For backcountry skiing and split boarding in Argentina, it’s a good idea to come early August onward, when a good snow base has had time to accumulate. Backcountry touring can be pushed well into late October due to remote hut access, longer days and spring corn cycles throughout vast Patagonia. Resort accessed backcountry touring in Argentina is best in August to mid-September for better chances of hitting the snowstorms rolling across the Andes. Expanding the ski season in Argentina? Backcountry touring is the answer. You can expect longer days, late morning corn snow cycles and south facing powder. Si amigo, south faces…remember you are below the equator. Discover more about these destinations offering backcountry access from the lifts in our ski resort chapter below. Like Chile on the western side of the Andes, climatic conditions in Argentina during the Southern Hemisphere winter vary considerably depending on where you are skiing or traveling. Expect a bit of everything, especially in the mountains. 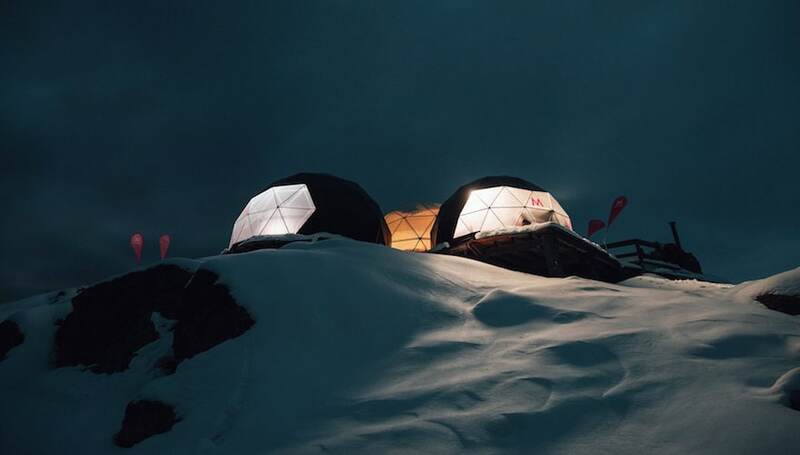 The high altitude at Las Leñas and other off the radar Mendoza area resorts brings drier snow than found in the Patagonia region, with generally large storms that are followed by wind and extended periods of high pressure. Temperatures vary greatly through the ski season often determined by wind and exposure to the sun. Overcast days with snow and wind bring temperatures down to the teens to 20F. On sunny days, especially in September, it’s going to feel hot as temps push into the upper 30’s to 40’s. Sometimes warmer. Sun screen is a must. Patagonia resorts (Bariloche, Chapelco, Cerro Bayo, La Hoya) see similar snow and weather as their counterparts on the other side of the Andes, but storms can come into Argentina colder and so the snow is slightly drier. One downside to snow in this region is lower elevation. Skiers on thin or warmer seasons may need to download off the resort via chairlift as the lower areas of the resorts can have patchy or no snow at the base. Thankfully the best terrain for skiing and snowboarding is found up higher on the resorts. Patagonia towns in the lower reaches can see rain, so a Goretex jacket and waterproof boots are a must bring. Around the Bariloche / San Martin regions, temperatures average highs of 40F – 50F, and lows of 30F – 35F. Las Leñas is cooler, averaging highs of 38F to 42F and lows of 27F to 30F. Farther south in Tierra del Fuego, Cerro Castor averages 29-32F lows and 39F to 45F highs. Before we cover how to get to Argentina and the most popular ski destinations, let’s briefly touch where it is located on the map. Argentina occupies the southeastern side of the “Southern Cone” of South America, bordered by Chile to the east, Bolivia and Paraguay to the north, and Brazil and Uruguay to the northeast. The nation’s capital Buenos Aires is 11 hours from New York, 9 hours from Miami, and 10½ hours from Dallas. Getting to Argentina is as simple as an overnight flight from North America or Europe, however access to all of the country’s ski resorts requires an additional domestic flight, unlike the ease of accessing resorts like Valle Nevado near Santiago, Chile. Flights arrive at the Aeropuerto Internacional Ministro Pistarini de Ezeiza (EZE airport code) in the country’s capital Buenos Aires. 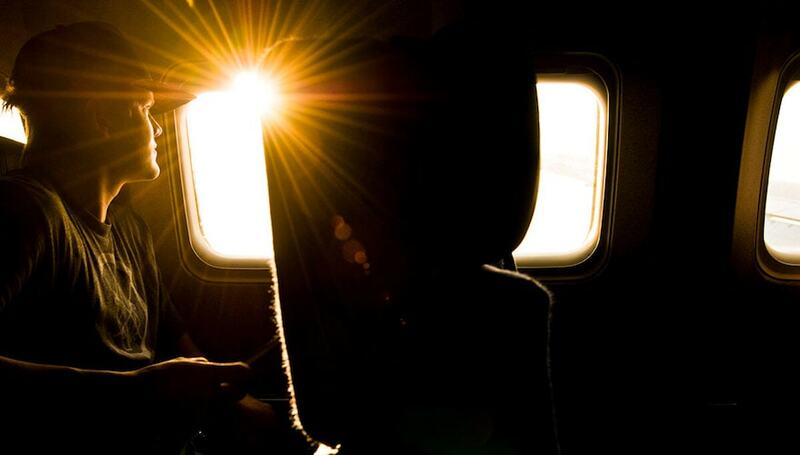 If immediately connecting to a domestic flight, be certain to check from which airport as many domestic flights leave from the Aeroparque Jorge Newberry (AEP airport code) about an hour’s shuttle from Ezeiza. Getting from airport to airport in the city is quite simple with options ranging from private transfers with English-speaking drivers to bus shuttles to taxi services. Aerolineas Argentinas offers you free shuttle between Ezeiza Airport and Jorge Newbery when connecting on their flights. More details to arrive to each ski area are on our individual resort pages. During the South American winter, Argentina is -1 hour from EST, so there is little to no jet lag for North Americans. A good app for airfare to Argentina is Google Flights. There are nonstop flights from New York, Miami, Atlanta, Dallas, Houston, and Los Angeles. American, Delta, United, Aerolineas Argentinas and LATAM all fly to Argentina. Cheaper flights on Copa and Aéromexico fly to Argentina from the US but all flights have a stopover in Panama City and Mexico City, respectively. Air Canada offers the convenience of direct flights from Toronto. American Airlines and Delta fly to Buenos Aires with a stopover in JFK Airport and Atlanta, respectively. Currently there are no direct flights from Australia to Argentina. Most flights have a stop in Santiago, Chile before continuing to Buenos Aires. If you plan on skiing in Las Lenas, it may make more sense to just book a flight direct to Santiago, Chile (SCL) and add on a 55 minute connecting flight on LATAM over to Mendoza. Then ground transfer to Las Lenas. Air New Zealand has a direct flight to Buenos Aires from Aukland. There are nonstop flights to Buenos Aires from London (Norwegian, British Airways), Madrid (LATAM and Iberia), Rome (Alitalia and Aerolineas Argentinas), Paris (Air France). Argentina’s extensive bus network is normally a good way to travel the country but beware of the tremendous distance between Buenos Aires and the eastern Andes. With a 14-hour trip to Mendoza and a 24-hour trip to Bariloche, air travel is clearly the way to go unless you have plenty of time to explore the country. All ski resorts in Argentina offer quality skiing and lodging options, with terrain and infrastructure set-ups that appeal to different kinds of skiers and snowboarders depending on amenity needs and ability levels. Ski areas such as Las Lenas and Catedral in Bariloche are in the international spotlight but there are some smaller destinations whose mellow Patagonian vibe and jaw-dropping natural beauty make them well worth a day or two on a guided adventure. 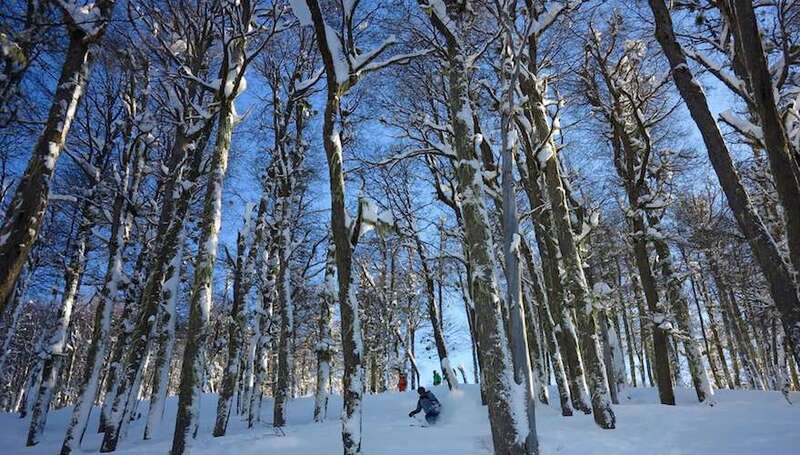 Lift tickets at Argentina’s resorts can run between USD $50-$80 depending on the peso fluctuation and high inflation. If you’re not planning to do a traditional or custom ski package or fully hosted tour, check the link below as the Argentina ski season nears for updated rates, which will come in handy if you plan to travel the country chasing snow, or just want to take a quick day trip to a local resort. Here we break down our list of the top Argentina ski resorts along with their highlights. We provide a link to each so you can dive deeper into researching the resort. By far, advanced/expert skiers seeking big steeps and deep powder make a beeline to Las Leñas, also for the revered resort’s endless backcountry options. Backcountry skiers might, however, go for the whole empanada and travel to one of the true backcountry resorts such as Baguales or Mallin Alto, where rustic lodging and sled or cat skiing assisted terrain puts them in the middle of the wildest regions of Patagonia Argentina. Skiers and snowboarders seeking more well-rounded options that include lift-serviced, groomed runs, stylish lodging and high-caliber restaurants, would do better at resorts such as Alta Patagonia Catedral in Bariloche or Chapelco in San Martín de los Andes, especially when traveling with kids. Smaller resorts such as Cerro Bayo find a happy medium with an intimate feel but with full services. Sitting at a dizzying 11,253 feet in altitude, Las Leñas is one of the world’s greatest ski resorts, known for its Marte Chairlift that opens access to mind-blowing wild terrain and backcountry opportunities. Centered around a purpose-built village known for its party scene, the focus at Las Leñas is trying to balance skiing and snowboarding and life off the slopes. Argentina’s most developed and modern ski resort, considered the place to ski in Patagonia, with close access to tourist-friendly and entertaining city Bariloche. Outstanding inbounds snowboard and ski terrain with open powder bowls and quality groomed runs. Intimate, family-friendly resort with few crowds, Cerro Bayo is a rustic “boutique” resort that is far from the bustle of Bariloche / Cerro Catedral, but still offers fun terrain and the same beautiful Patagonian ambiance. Awarded Best Ski Resort in Argentina 2018 by the World Ski Awards, this mid-sized ski center sits high above the charming, Swiss-like village of San Martín de los Andes. A modern and recently upgraded infrastructure, plentiful variety in lodging and dining, and something-for-everyone terrain. Stunning location in the Patagonia wilderness in Lanín National Park. 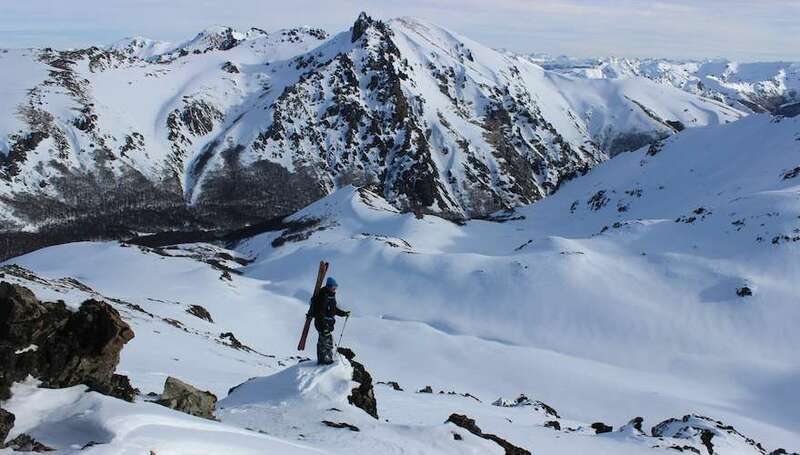 This outstanding cat skiing operation located one hour south of Bariloche, Baguales is a one-of-a-kind wilderness experience that easily rivals similar operations in North America, connected by 6 backcountry huts and rustic lodges. Snow cats, sleds and backcountry touring across 25,000 acres of Patagonian terrain, this is one of our top picks for true adventure. The bad news? They may not open in 2019 due to a recent sale of the property. Just 23km from bustling Bariloche, Mallin Alto’s wild Patagonia location, geodome lodging and rustic “refugia” huts, make it feel a world away. This is sled-accessed backcountry skiing terrain without a ski lift in sight. It all started here back in 1998. Guided ski adventures in Patagonia. Now that you have learned about Argentina skiing, we’ll cover important details and facts you should know before heading south this year. Passports should be valid for at least six months before the arrival date. Immigration and customs are straightforward when arriving in Argentina. In 2016, Argentina dropped the reciprocity fee for Canadians and Americans, so there is no additional cost to enter the country. There is no visa required to enter Argentina. If a traveler is located outside the European Union a travel visa may apply so be sure to check with the Argentine Consulate. No vaccinations are required or needed to enter Argentina. Tap water is safe to drink. Travel health insurance is encouraged as most policies from home will not directly pay a clinic or hospital bill while in Argentina (some policies might reimburse medical costs once you’re back home but you’re responsible for paying bills upfront). The electrical current is 220V/50Hz. Argentina uses type C two-prong plugs and type I plugs with three flat prongs, with some outlets featuring a hybrid that accepts both type I and C plugs. The monetary unit in Argentina is the peso (AR$), issued in denominations of two, five, 10, 20, 50, 100, 200, 500 and 1,000 pesos. Argentina’s economy took a bad turn in 2018 and the peso continues to quickly devalue, although paired with soaring inflation any savings foreign travelers might enjoy is negligible so keep updated on the latest exchange rates vs. average costs. Many businesses will accept US dollars but always have pesos on hand as well. Check xe.com for current exchange rates. Banking hours are Mon-Fri, 10am to 3pm. ATMs (cajeros automáticos) are plentiful and offer the best and most up-to-date exchange rate, but in heavy tourist areas can often run out of money. ATMs charge a user fee but if you have a debit card from these USA banks, fees may be reimbursed to your checking account. Argentine Spanish, heavily influenced by Italian immigration, uses a “sh” sound for double L’s and words with ya and ye. The Argentine accent is unlike any other Spanish accent in the Latin world, and usually accompanied by animated hand gestures. It is becoming customary to leave a 10% tip at restaurants. Porters and maids should be tipped whatever the exchange rate for several US dollars is for that day. You do not need to tip taxi drivers. Travelers should be vigilant of petty crime such as pickpocketing, vehicle break-ins, and scams, but really most of these kinds of crimes take place in major cities such as Buenos Aires and less so in ski-centric destinations. Patagonia was coined after a mythological race of giant humans, fabled to be 15ft tall, were seen on the coast of Argentina in 1520 during Magellan's expedition. Argentina comes from the name argentum, the Latin word for silver, due to the early belief that the country was replete with the precious metal. Argentina is the largest Spanish-speaking country. There are, however, more cows than people given the country’s love affair with beef. The highest mountain in the Western Hemisphere is in Argentina, Mount Aconcagua, reaching 22,841 feet high. 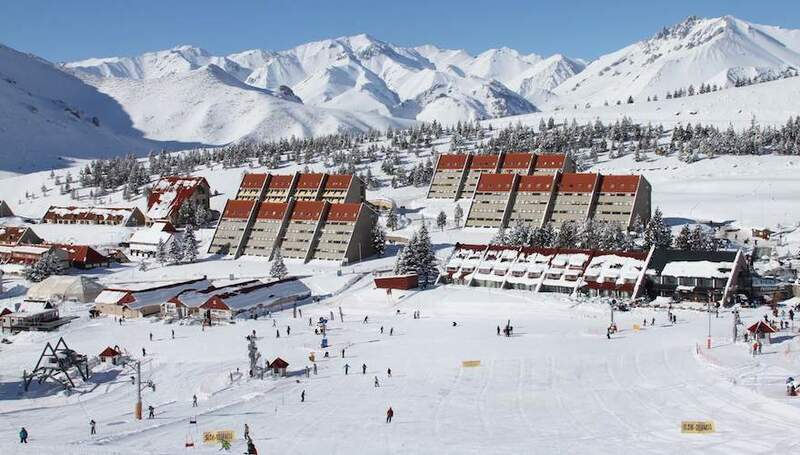 The best resort to see the massive peak, however, is in Chile, at Ski Arpa. Argentina is a rich burial ground for dinosaurs, including the Eoraptor, the oldest predator dinosaur fossil found to date, discovered in 1993. In 2001, Argentina had 5 presidents in 10 days. Yerba Mate is the national drink of Argentina, a tea-like leaf from the evergreen tree of the holly family, sipped through a metal straw out of a gourd. For gauchos, it keeps hunger at bay when on long horse rides. The legendary Butch Cassidy and the Sundance Kid spent time on a ranch near the Andes in Patagonia after fleeing the US. A stunning 7 night, 8 day fully guided advanced off-piste adventure exploring the best resorts and out of bounds terrain of beautiful Northern Patagonia. Backcountry? You bet! 2 full days of snow mobile accessed backcountry descents in one of Patagonia’s wildest private haciendas.